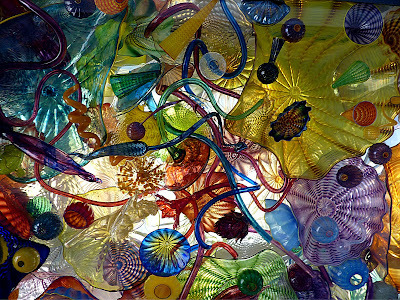 Tacoma was our next stop and the plan is to visit the Chiluly Glass Museum. 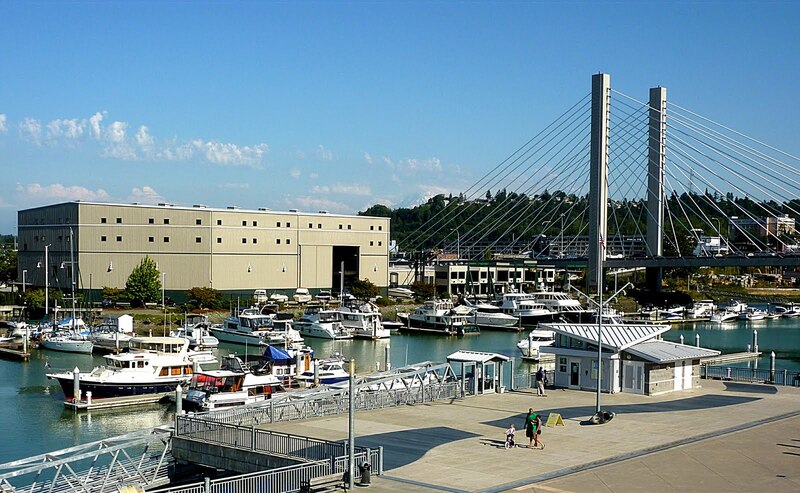 The museum is close to the Thea Foss Waterway and we have reservations at the Dock Street Marina, the 2009 Marina of the Year. 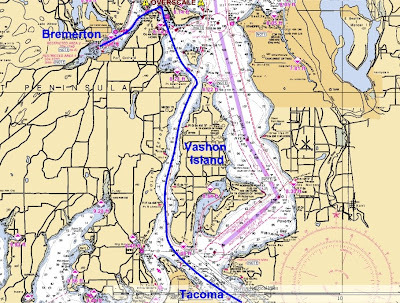 Our route from Bremerton to Tacoma. 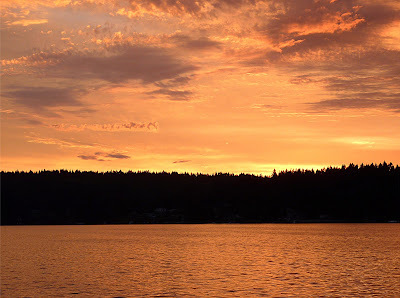 We worked our way north out of Sinclair Inlet and past Port Orchard, through Rich Passgae then turned south. along the east side of Vashon Island, crossing Dalco Passage and entering Commencement Bay and Tacoma. The ferry Rhododendron, with Mt. 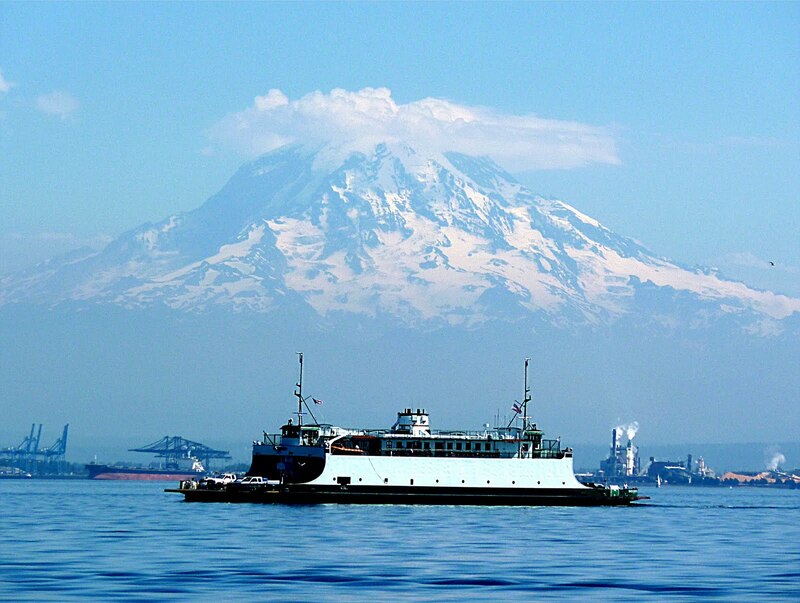 Rainer in the background, runs between Vashon Island and south Tacoma. 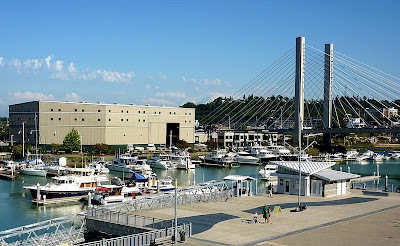 Dock Street Marina was awarded the 2009 Marina of the Year. Its dock fee reflects that distinction. 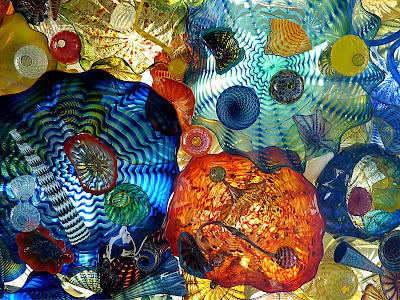 The Tacoma area around the Chiluly Glass Museum has recently been redeveloped. New buildings, rehabilitated structures, modern bridges, and spacious public areas adorn the downtown. Dock Street Marina is quite close to all this and the Glass Museum. Art glass is scattered about the public spaces, walkways, and galleries as well as inside the museum. The museum was definitely interesting and worth a couple visits. Glass artists demonstrate technique inside the Chiluly Glass Museum. Even more bridge tunnel art. 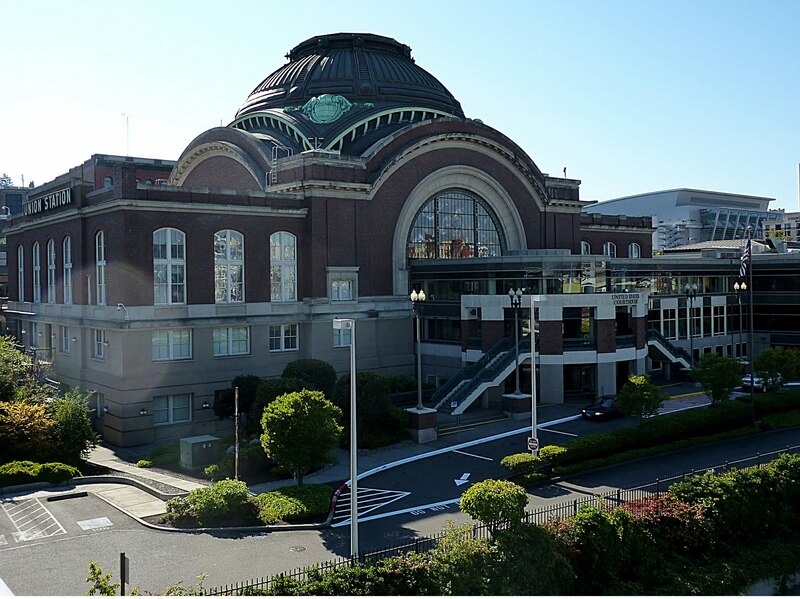 Redeveloped Tacoma: new buildings made to look old. 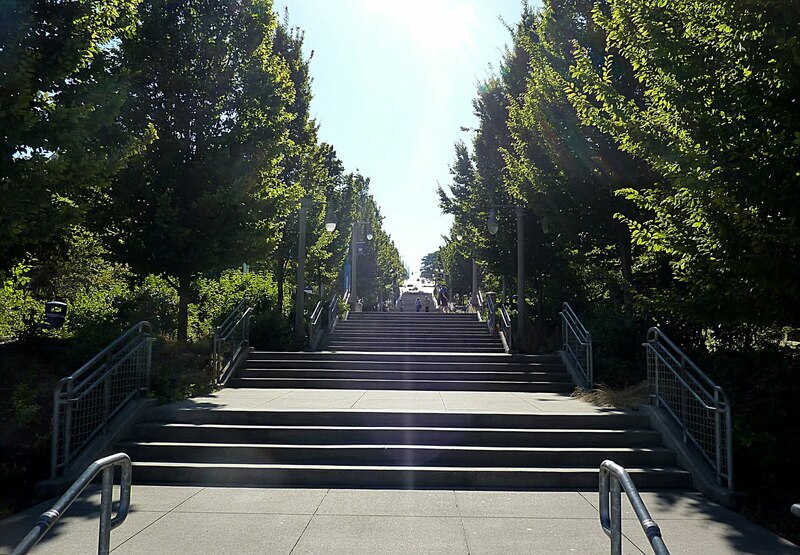 Stairway in center of Tacoma redeveloped district. Old building made to look new. Tacoma is a great place to visit. We'll be here again in two weeks. Can't wait!. We arose at 4:30AM in the dark and left the dock at first light. 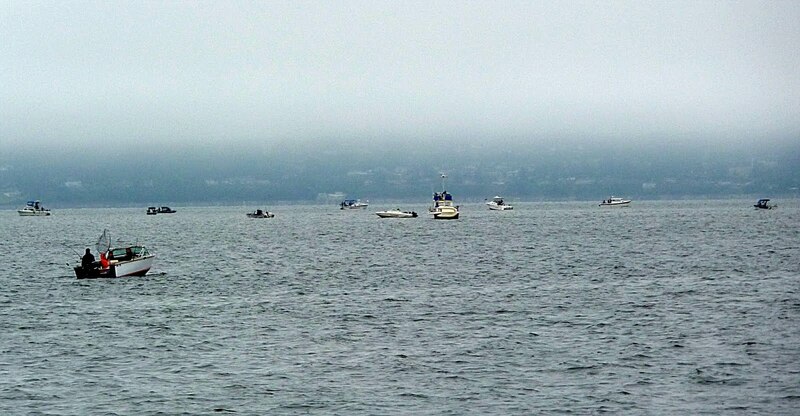 We weren't the only ones as we joined the crowd of sports fishers, an exodus from Everett towards the salmon of Possession Sound. At 6AM we entered the trolling cycle with scores of other boats, zig-zagging across, up and down current, in the area just off Whitbey Island's southern tip. There were fish. We could see them and the bait balls clustered underneath us. We used diving planes to get our tackle deep, down where the fish showed up. We're not convinced they work so well. After 3 hours we had 3 hookups. We landed three fish. They were all large ......... dogfish! Yuk! 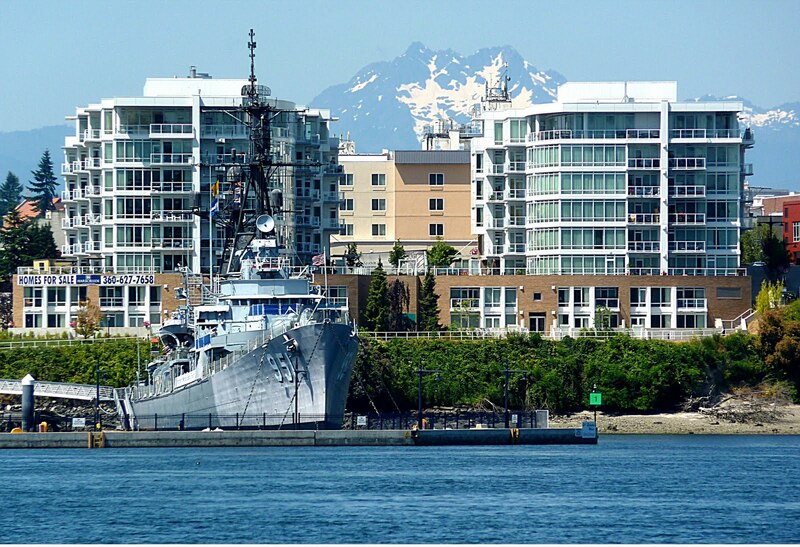 We moved onto Shilshole Bay Marina. Shilshole is a first class marina with easy access and fine docks. 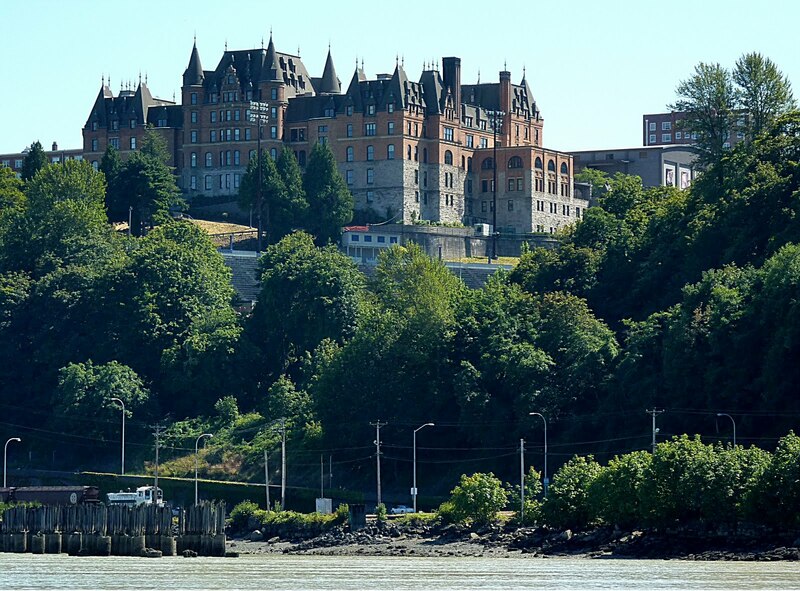 It is also close to another tourist sight: the Chittenden Locks. 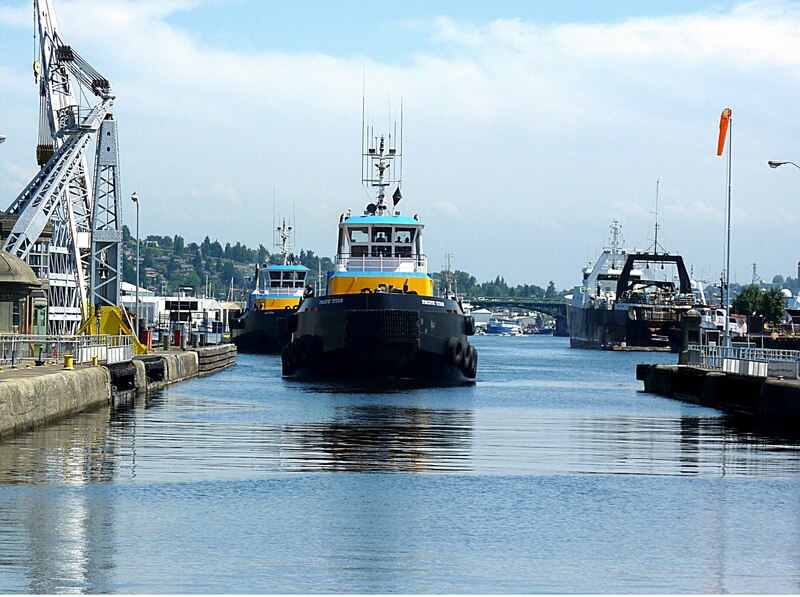 The Locks allow vessels large and small to enter and exit Lake Washington and Lake Union to and from Puget Sound. It 25-minute walk from the marina to the Locks and it was good to stretch our legs. 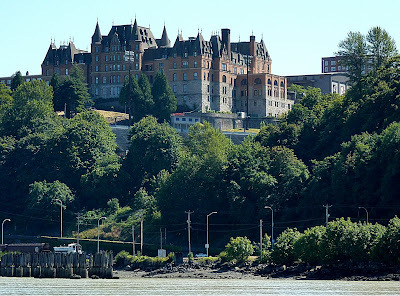 The Hiram M. Chittenden Locks were built in 1908. 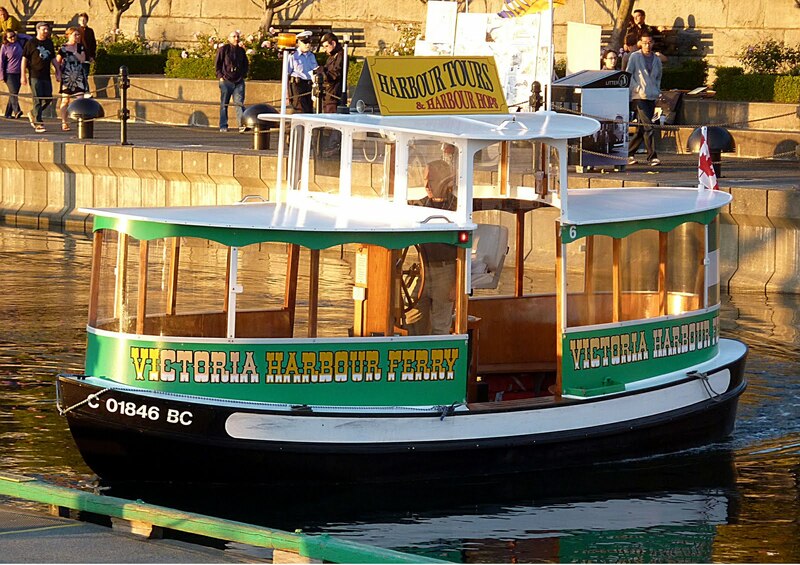 Locally they are known as the Ballard Locks. The Locks maintain Lake Union and Lake Washington at 20 feet above sea level. The Locks are operated by the Army Corp of Engineers. My favorite time at the Locks is Sunday afternoon about happy hour. 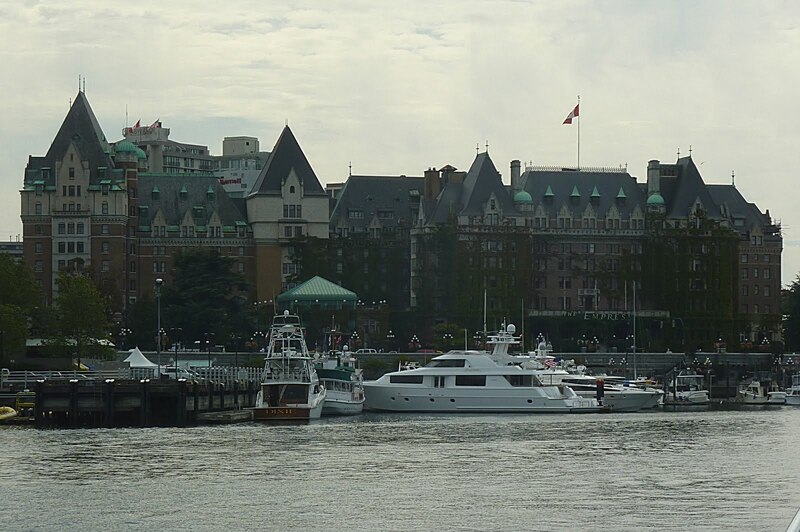 Don't be surprised if a transiting boat skipper offers you a cocktail! Sea gulls spaced evenly apart guard the Ballard Locks. 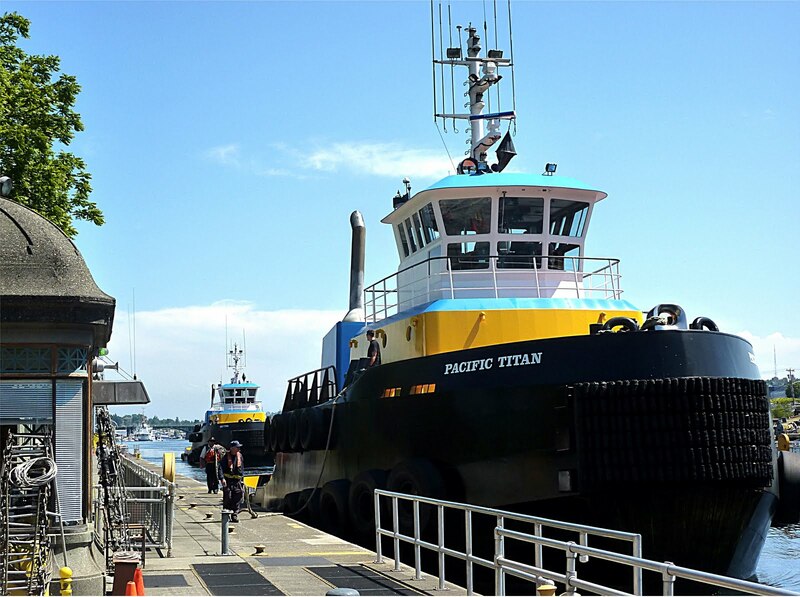 Two large towing tugs enter the locks westbound out to sea for Alaska. 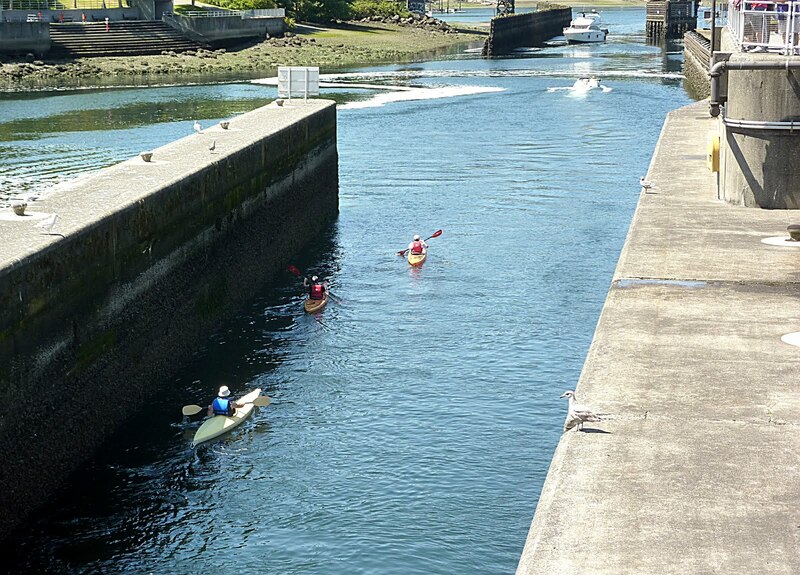 Both big and small boats pass through the locks, these kayaks being the smallest. On Tuesday we enjoyed a quiet cruise south, further down the east side of Whitbey Island. After Saratoga Passage we arrived at Everett. 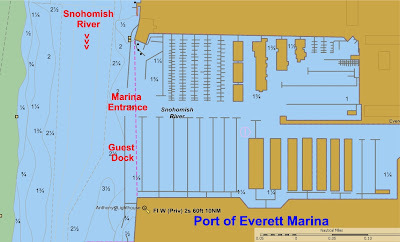 The Port of Everett Marina is quite large, one of the largest in the State. However, its entrance along the Snohomish River leaves a lot to be desired. At low or ebb tide, the River outflow of several knots makes the marina entry or exit a real challenge, and in our case almost impossible. As we turned toward the entrance opening we had 4 knots of River pushing us sideways, towards the large pylons. Even with our wide, upstream turn, we barely avoided colliding. Once inside, we turned towards the guest side-tie, only to be swept away. Thruster on full power held us steady but we didn't gain against the sideways current and had to bale by backing upstream. We finally settled for an outside side-tie, bow pointed up-river, with current pushing the boat into the dock. Later the flood tide swept in towards our stern causing lots of splashing waves against the swim-step. 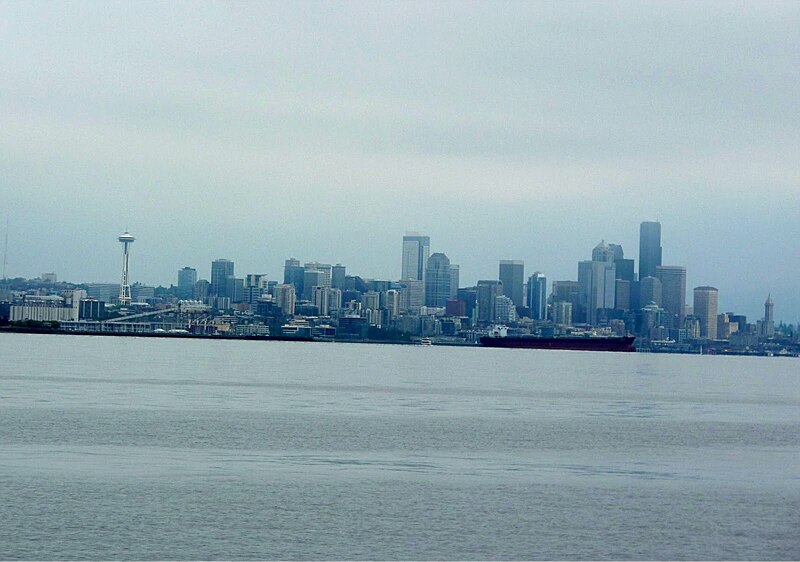 It was no fun place to be moored, so we tied the boat tightly and left for a tour of the Boeing Aircraft factory. 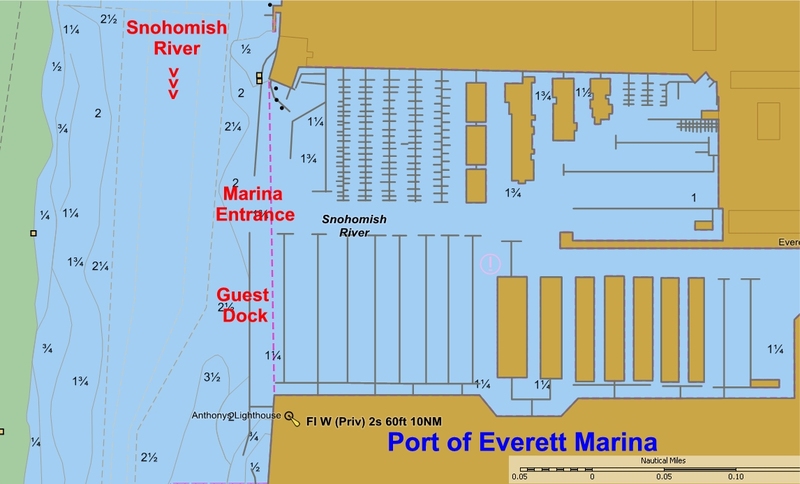 Everett Marina is a challenge at low tide due to the Snohomish River outflow. 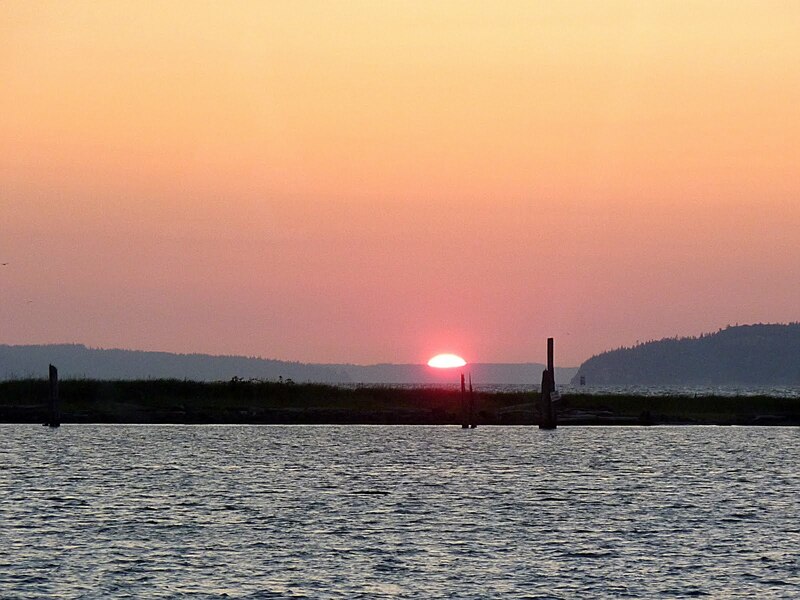 The pretty sunset in Everett almost made up for the screwy current across the marina entrance. Boeing gives a great tour of its factory production line for the 737, 747, 767 and 787 aircraft. The factory building is the largest by volume in the world. 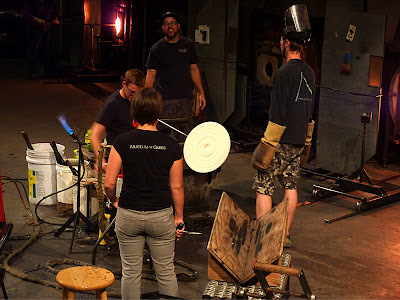 The production and assembly techniques are explained by the informative guide. Tunnels and elevators allow the tour groups to view the operations from many angles. We highly recommend the Boeing tour and museum. Of course cameras weren't allowed, even the infamous Wild Blue Blog reporter could not secure a photo credential. Hence no photos! The early morning crowd off Possession Point clamoring for salmon. 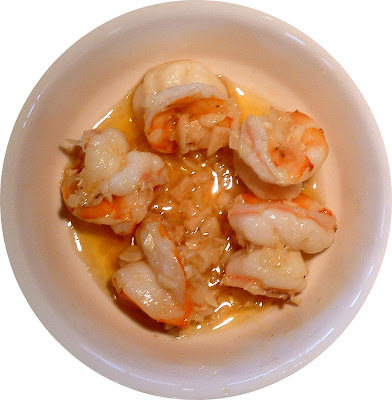 We enjoyed Italian out, but nothing compares to a Vince Fonte pasta. He should be in the restaurant business! 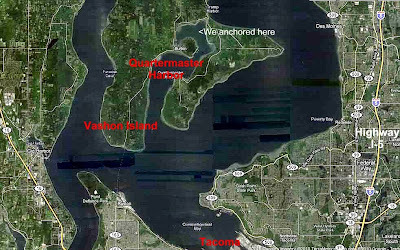 We plotted our assault on those poor salmon off the south end of Whitbey Island. We hope to clean house tomorrow early off Possesion Point. Armed with Jay Field's tips, it should be easy! On Saturday the college boys left. Alex readied the boat for the next set of guests. The Watkins arrived on Sunday along with Pat ready for the cruise down Puget Sound. The crew met with local fishing expert Jay Field to get the latest tips. Jay rigged up several "guaranteed salmon" tackle for our poles. We checked the propane supply to insure we had enough cooking gas for all that salmon soon to be jumping into our frying pans. 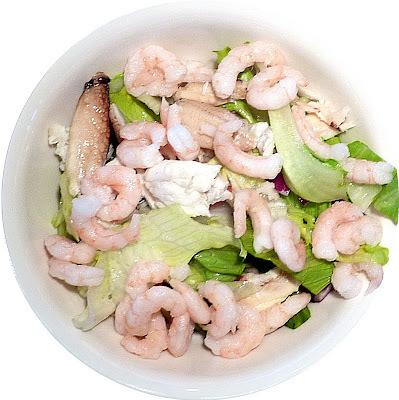 And by the way, Willie prepared some tasty fried salmon last week. Fried salmon is grrrreat! 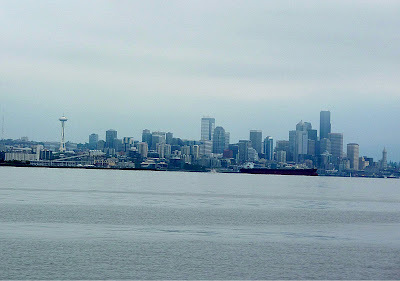 On Monday we had decided to check out La Conner, Washington. 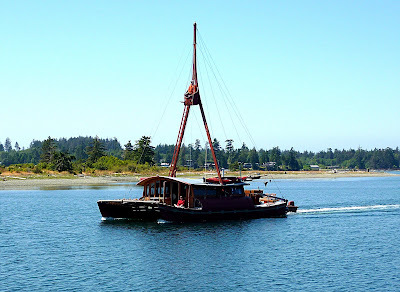 It entailed cruising into the shallow Swinomish Channel. Our transit coincided with a -1 foot tide and unfortunately the Wild Blue would stick to the bottom at this extreme low tide. 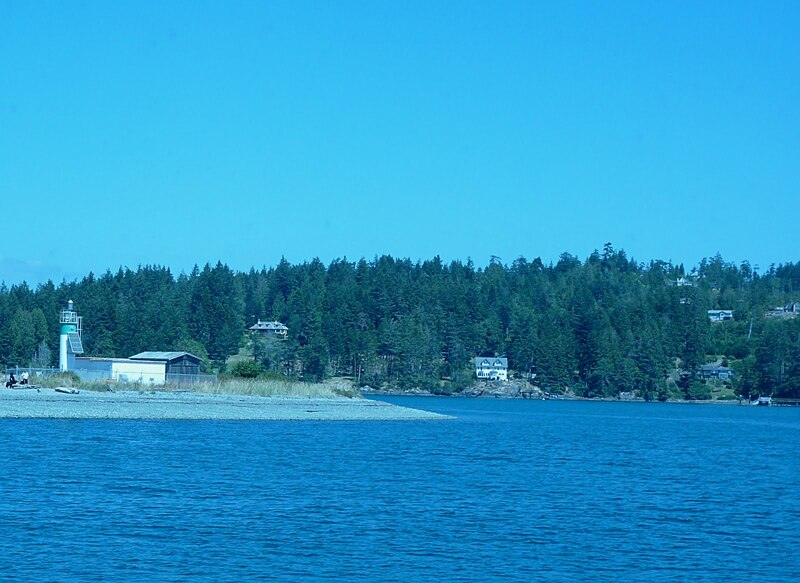 So instead we opted to skip La Conner and head for Coupeville on Whitbey Island's eastern shore via Deception Pass. We departed at 9AM to make slack current in the notorious Pass at 10:30. 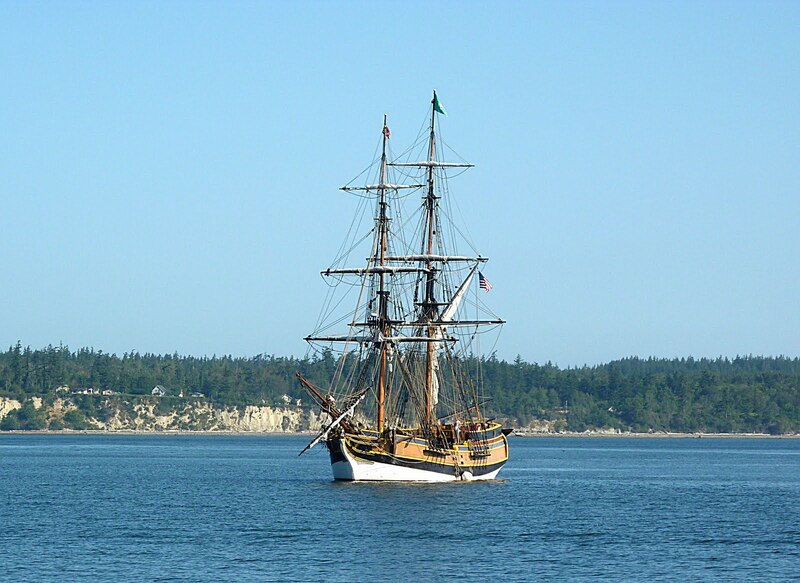 Just outside of Anacortes, a replica sailing ship cruised by. 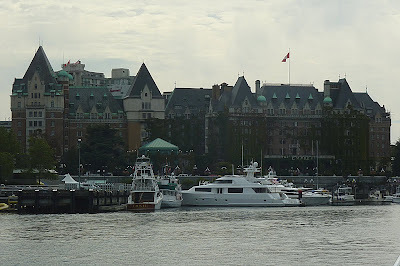 I though I could see Captain Vancouver aboard, but he to was a replica. The Deception Pass bridge of almost 1000 feet connects north Whitbey Island to Fidalgo Island and Anacortes. It was built in 1935. The currents in the pass reach double digit speed, causing watercraft to transit at or near slack current. 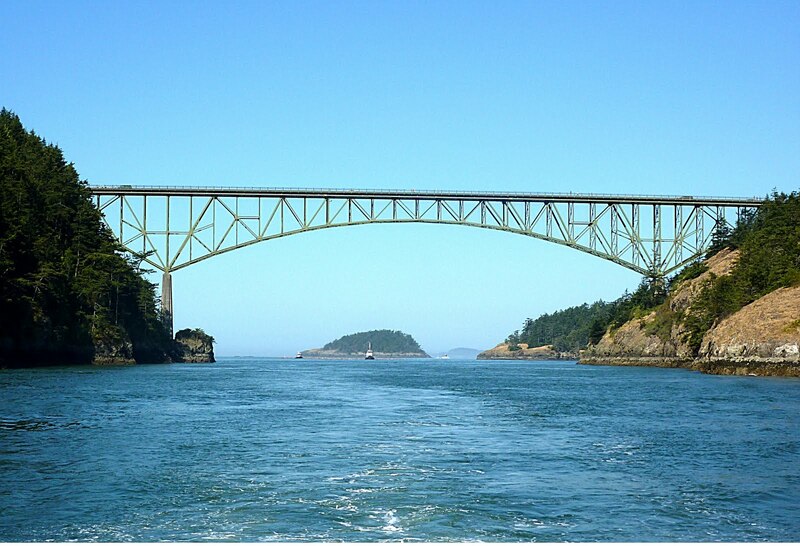 We timed it correctly and passed under the Bridge near slack, along with scores of other boats crossing the Pass. Soon we were in the calm waters of Skagit Bay making our way south. While operating a boat equipped with a VHF radio, the boating regulations require that the radio be turned on and tuned to Channel 16, the marine calling and distress frequency. 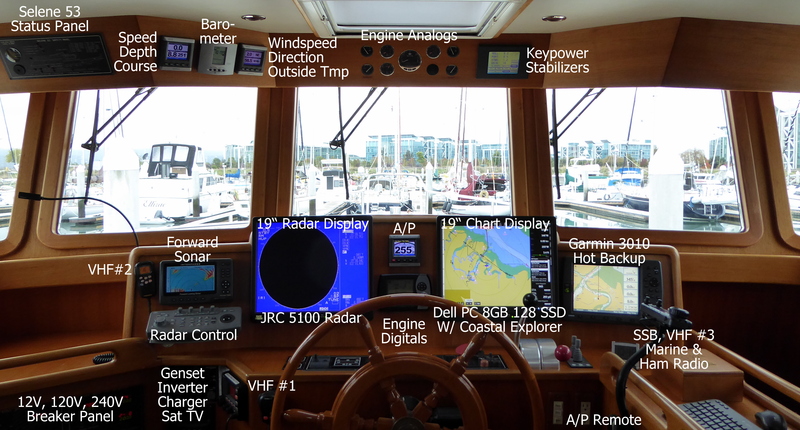 We have 6 marine VHF radios aboard Wild Blue, 3 fixed mounted and 3 hand helds. At least one radio is always tuned to Channel 16 with the volume up. Sometimes the chatter and squelch noise becomes annoying. At other times a distress call captures our attention. When that happens we turn up the volume and listen closely. 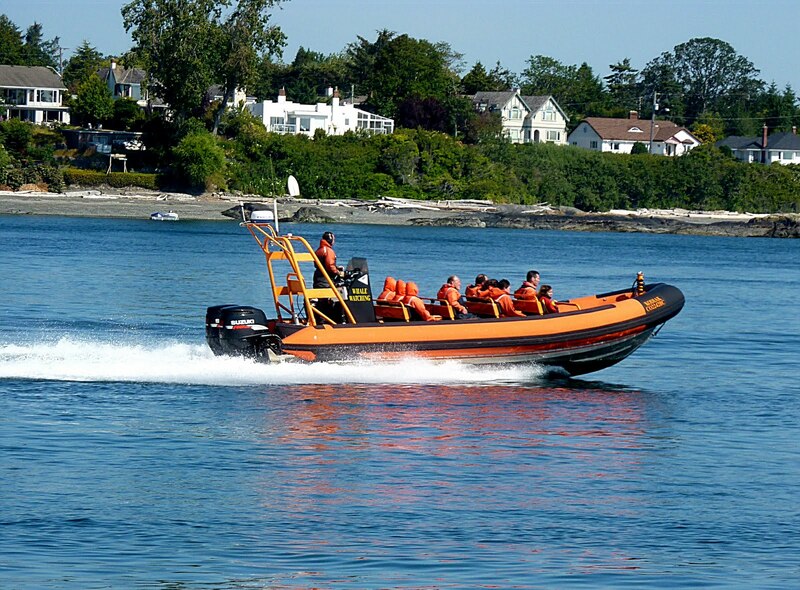 Just as we entered Skagit Bay, a loud distress call had us glued to the radio. "U S Coast Guard, U S Coast Guard, this is sailing vessel Whiskers calling, Whiskers, over!" blared loudly through the speaker. The fact that the voice was clear and loud meant the call was local to us. "Vessel calling, this is Coast Guard Port Angeles, over." The captain of Whiskers continued the radio call, describing his situation. 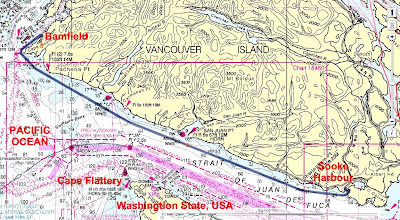 His boat had run aground in the Swinomish Channel near Skagit Bay. Just ahead we could see Whiskers aground in the Channel. We were compelled to come to his aid, except for the fact that the Wild Blue would run aground too, we would have aided him. Luckily there were two smaller vessels in the area that did come to his aid. Later we heard via the radio that he had been pulled free. It's a good thing we decided to visit La Conner another day! 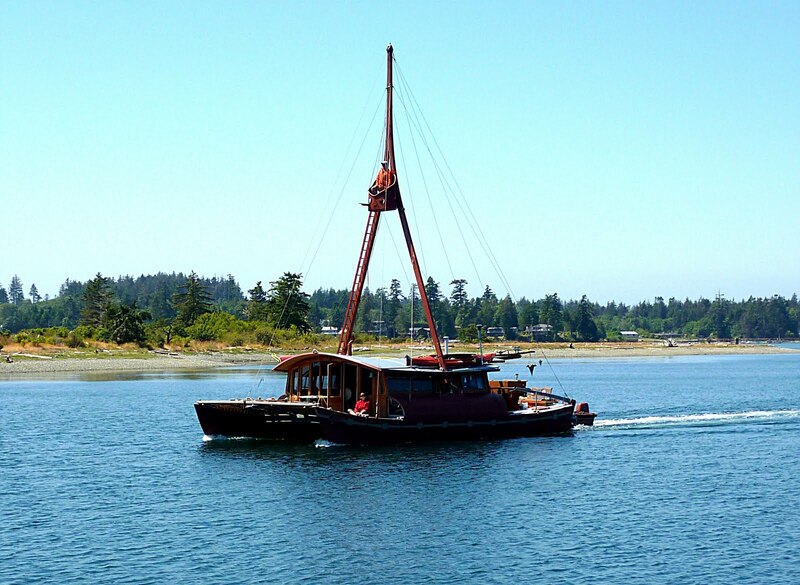 Sailing vessel "Whiskers" (on left hand side of photo) aground in the Swinomish Channel. 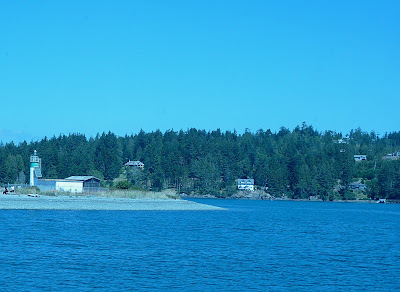 We continued south down the east side of Whitbey Island, the longest and largest island in Washington State. 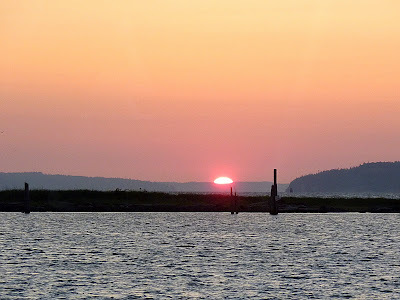 We eventually entered Penn Cove and anchored near the south side just off the Coupeville public dock and pier. We tendered ashore and enjoyed lunch on the pier and an ice cream ashore. 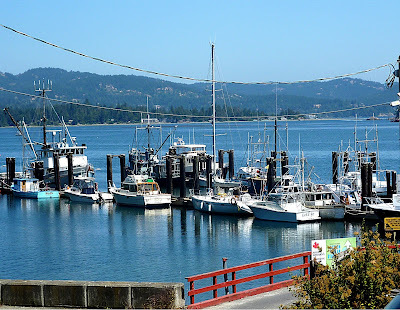 Later we rode the free bus to Oak Harbor and saw the sights. Tomorrow we head for Everett, WA. 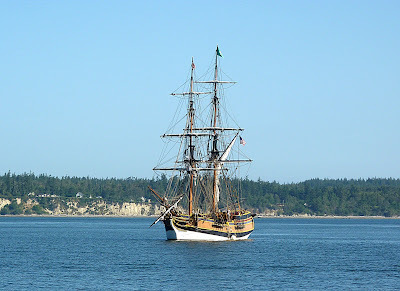 At anchor off Coupeville, Washington with Mt. Baker in the background. These Coupeville birds aren't put off by us tourists. 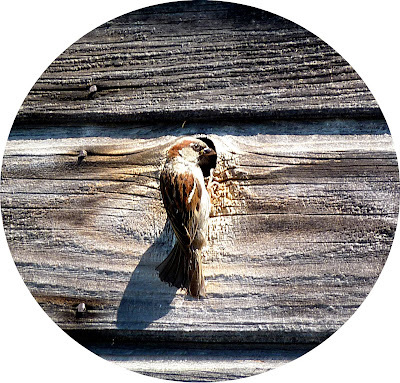 This one gives us the evil eye while feeding her young on the other side of the knot hole. It was a sunny and breezy morning in Roche Harbor. 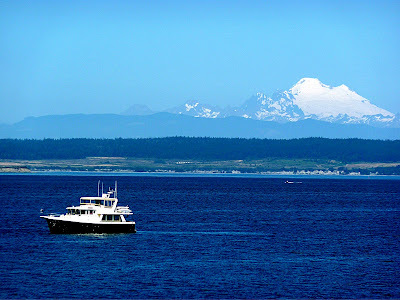 Today we departed for Friday Harbor on the other side of San Juan Island. The Wild Blue has been there many times including the entire summer of 2006. It's about an hour by boat over the north side of the Island. 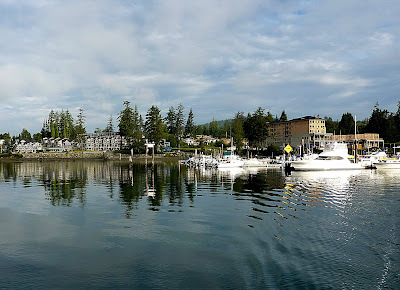 We arrived mid-morning and temporarily docked awaiting permanent moorage to open up. 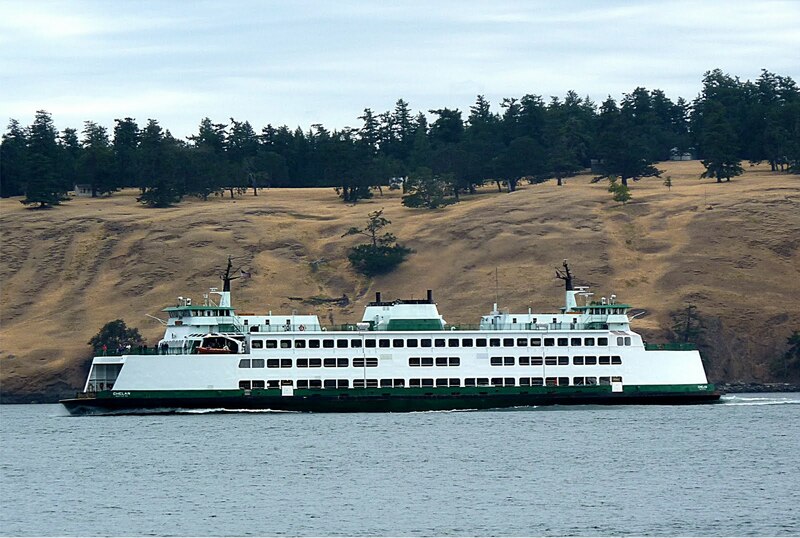 The Washington State Ferry Chelan with cars, trucks and people aboard on her way to Sidney, BC from Anacortes, WA. 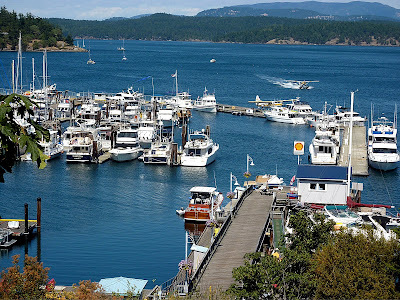 Friday Harbor is a busy marina in the summer months. 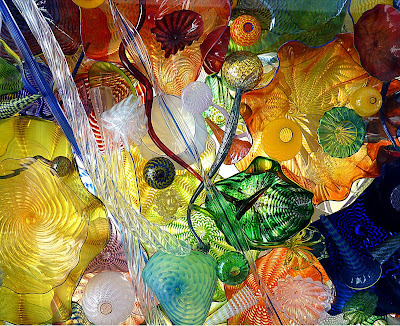 See Friday Harbor for more information. 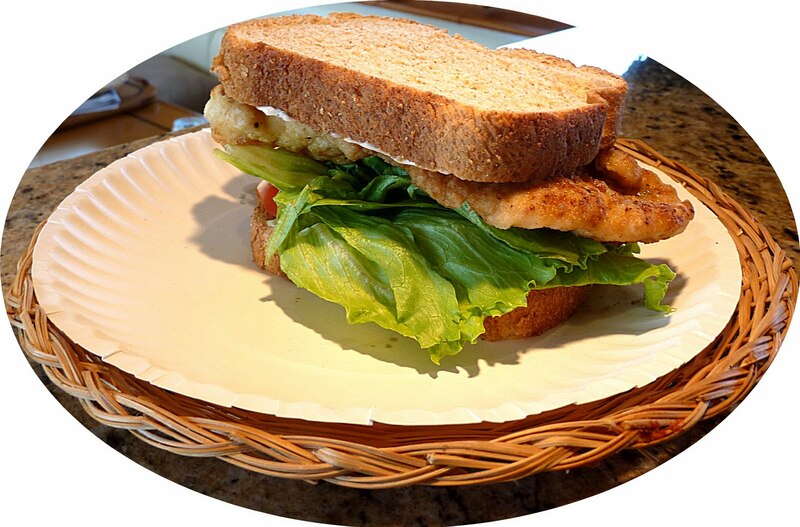 While waiting for our moorage assignment, Willie prepared fresh-fried rockfish sandwiches. Delicious! Soon we received a slip assignment and docked near the marina entrance close to the downtown. We roamed ashore helping Joe gift shop for his family. 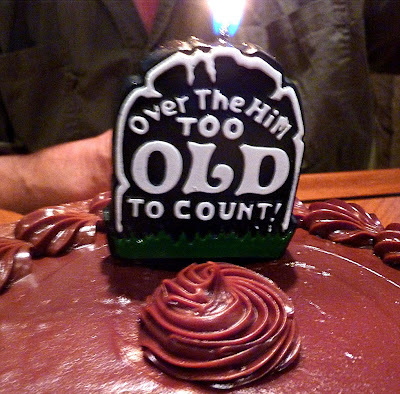 We soon tired of that and adjourned to the local pub while Joe continued his gift quest. After an afternoon nap we dined in town at Vinny's Italian restaurant. (See www.vinnysfridayharbor.com). We ended the day with John Wayne in "Island in the Sky". We said goodbye to Victoria today and just as we had Wild Blue untied from the dock and turned to exit the Harbour, the Coho ferry came around the corner into the inner harbour, causing us to jog to starboard to give the big ship turning room. 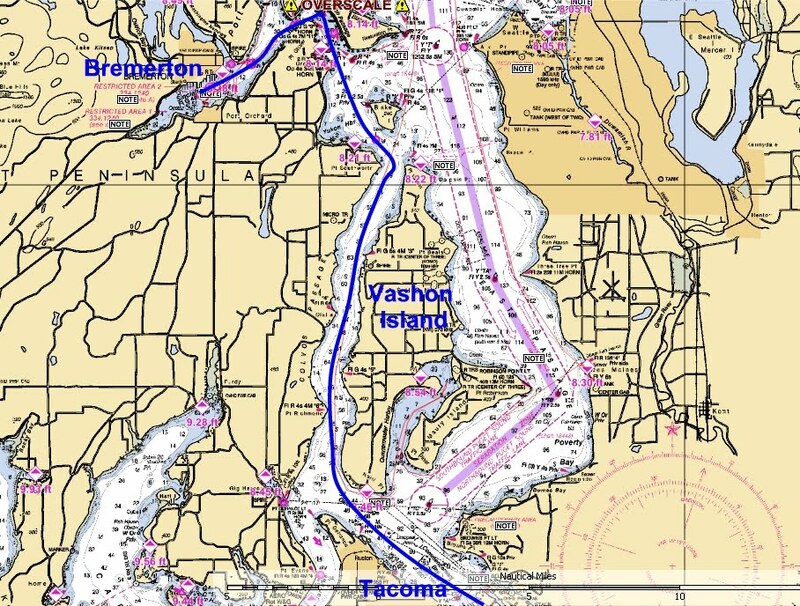 Thanks to our AIS system, we saw Coho coming before she rounded and waited for her to pass. 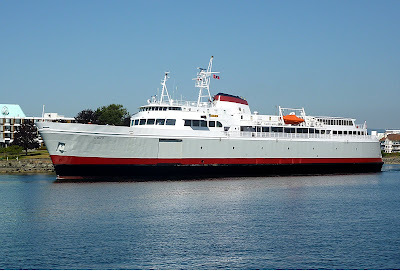 The Coho ferry built in 1959 still operates on schedule to and from Port Angeles, WA to Victoria, BC. 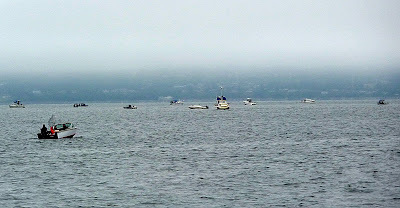 Once outside Victoria, we had flat seas with sun, mixed with the occasional fog bank. 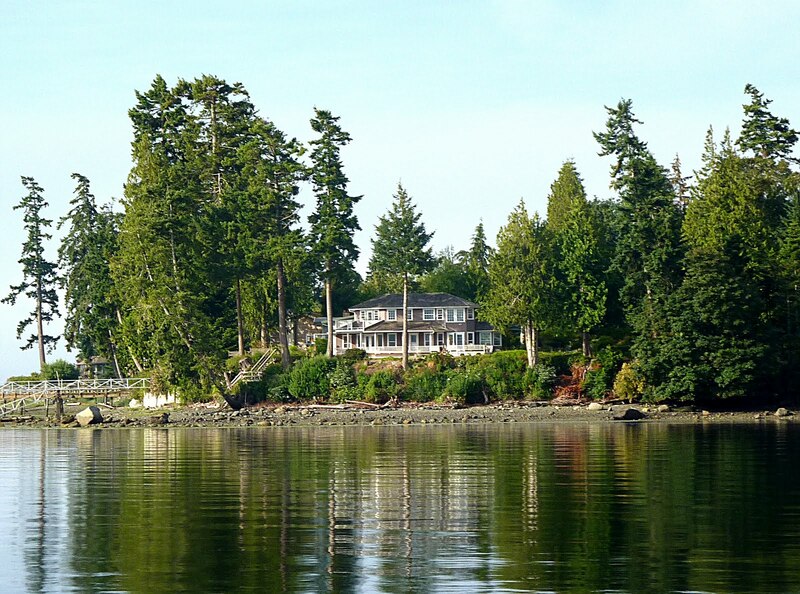 We hugged the southeastern coastline of Vancouver Island using Mayor then Baynes Channel to clear the Island's coast into Haro Strait. 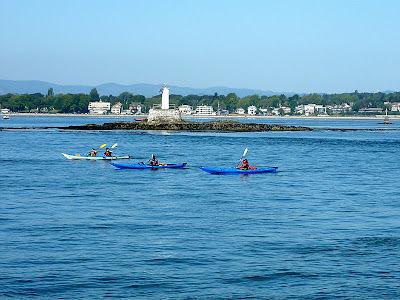 Fast moving whale watch vessels zipped past us, and in turn we both zipped past groups of kayaks. 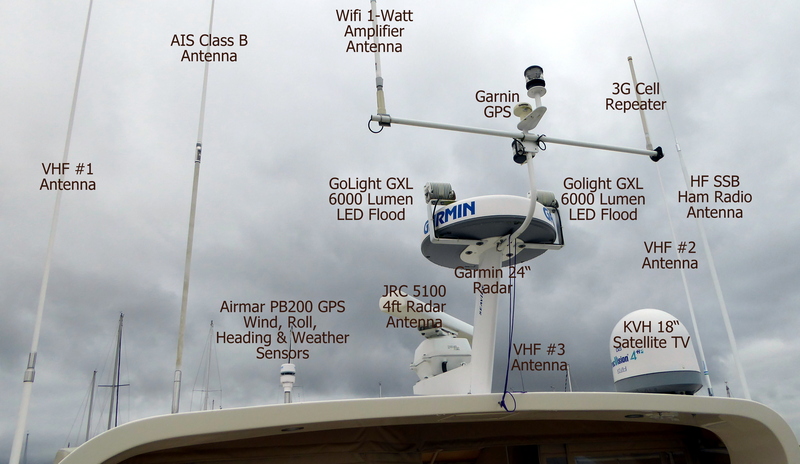 Ship traffic seemed to be increasing and we crossed the shipping lane between two large container vessels in a low fog bank, relying on radar and AIS to delineate their locations . We reached the west coast of San Juan Island as the fog lifted and entered Mosquito Pass to Roche Harbor. We prepared for US Customs clearance. 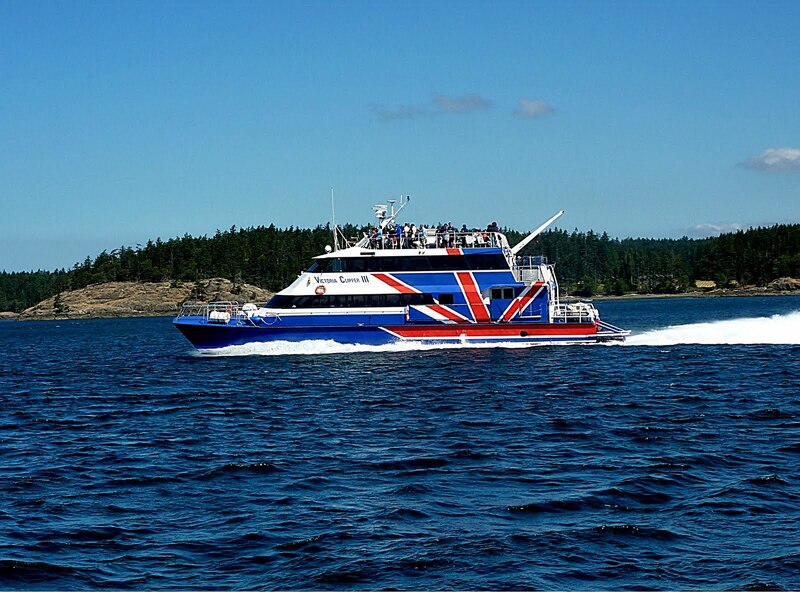 Whale watch vessels speed tourists to the last reported Orca whale position. I sure hope they slow down for the whales! 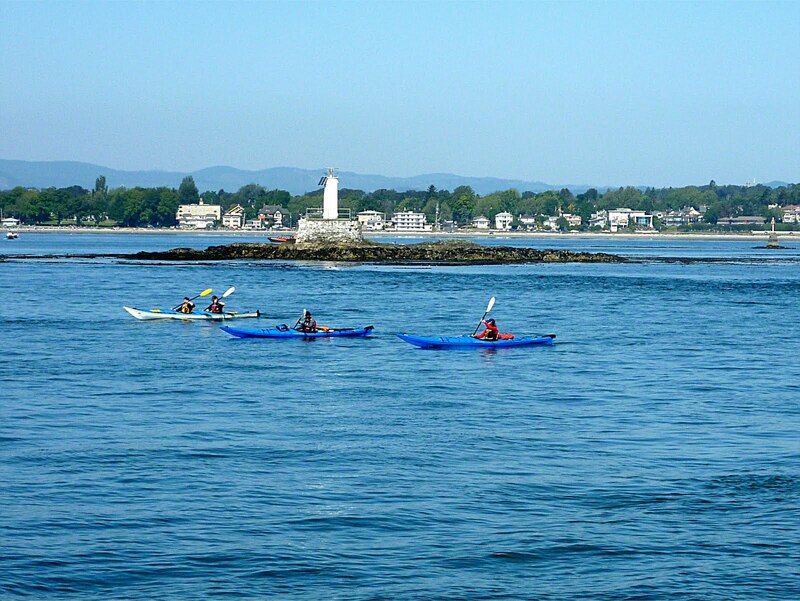 Kayaks must dodge the whale watchers and other pleasure boats. Our US Customs experience was expedient. We only needed to trash two tomatoes and our American cigars were once again allowed into the USA. The customs agent didn't question our ornamental indoor plants as in the past. 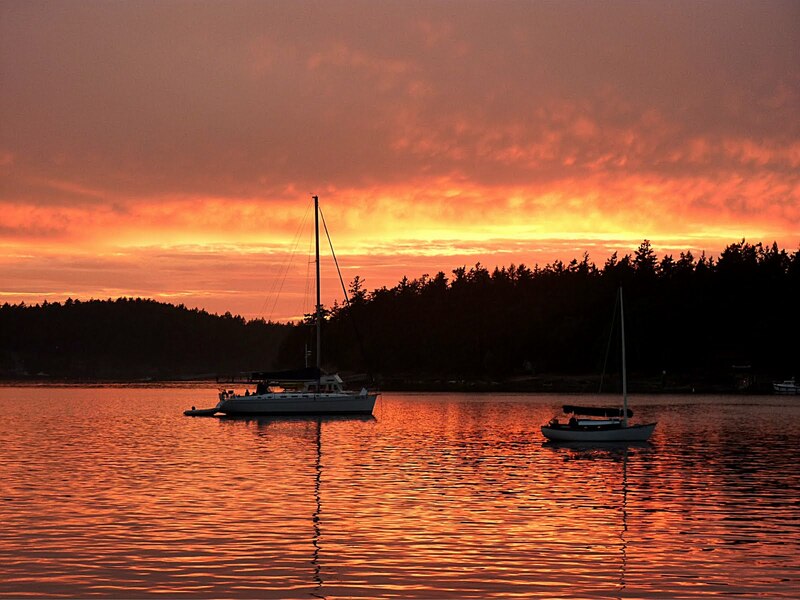 Roche Harbor Marina had a moorage assignment for us and we tied to the dock once again. We roamed ashore visiting the sights. Willie prepared a multi-course epicurean epic feast. It was a real "guys" style dinner. 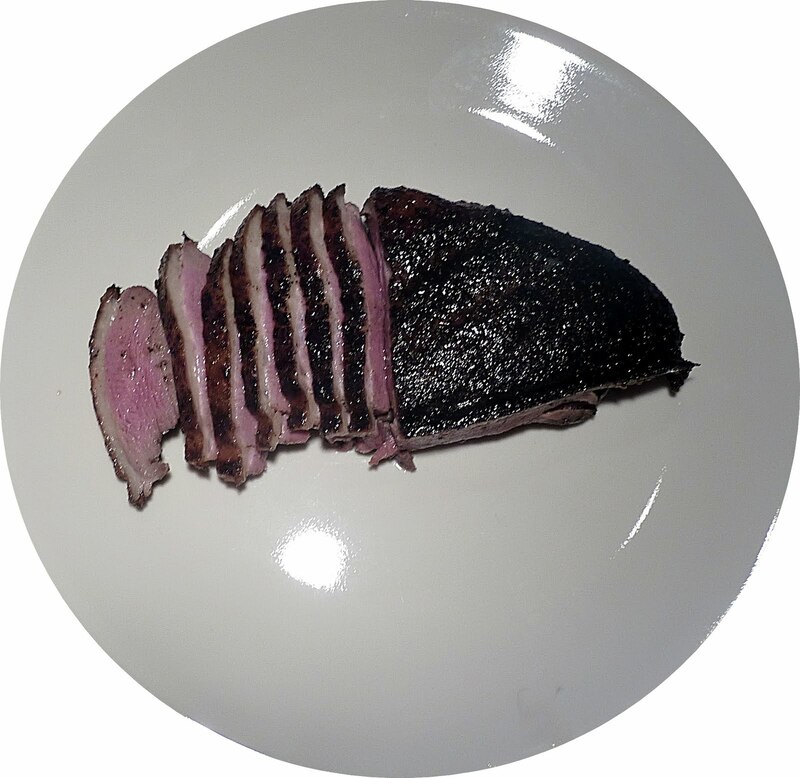 First Main: BBQ duck breast, sliced rare. Second Course: Baked Buffalo chicken wings. Dessert: John Wayne in Rio Lobo. 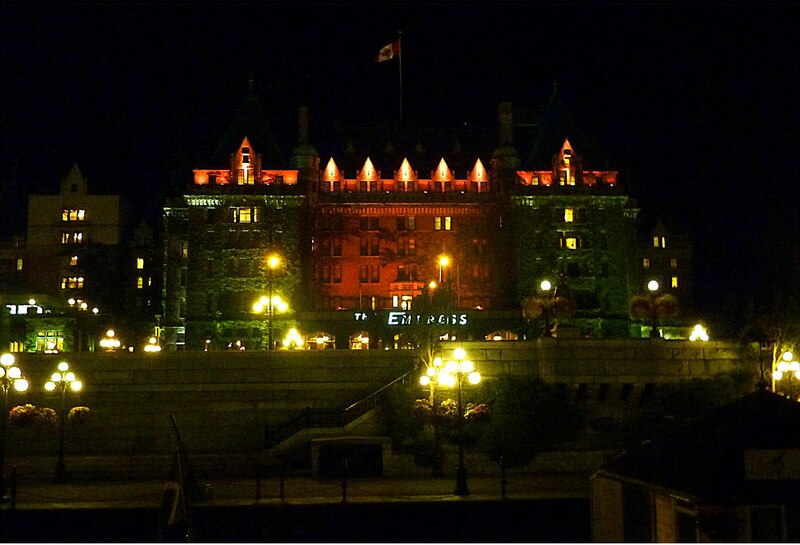 It's dark at 4:30AM on Monday. The crew is asleep, hungover from a late night dinner party of BBQ lamb chops from Willie's ranch. 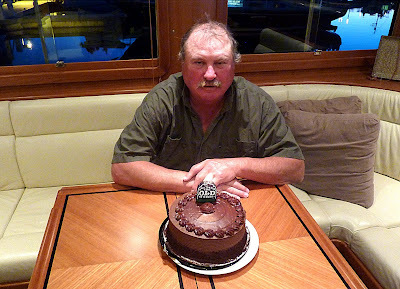 Gary from the sailboat Azad joined us for dinner, and again the group watched another movie from the John Wayne Collection. Hey! This IS an all man's cruise and we watch John Wayne every night! Last night's feature: The Sons of Katie Elder. Alex makes coffee, then stows the electrical cable, hose, unties all except for two lines and starts the engine. At last the crew comes alive and we depart for a long journey down Vancouver Island's west coast to Sooke Harbour. Our 70-mile run down the coast to Sooke Harbour. 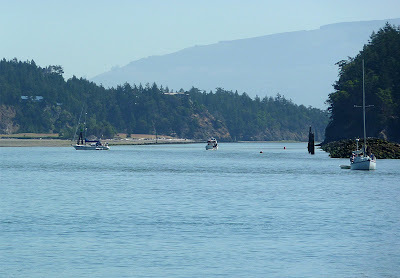 Once outside Bamfield Inlet we turn left to the ocean, then left again, pointed down the coastline. We're about a mile off the coast in 20 fathoms (120 feet) and the seas are bumpy but bearable. We immediately pass Cape Beale, then 3 hours later, Cape Carmanah the halfway point. 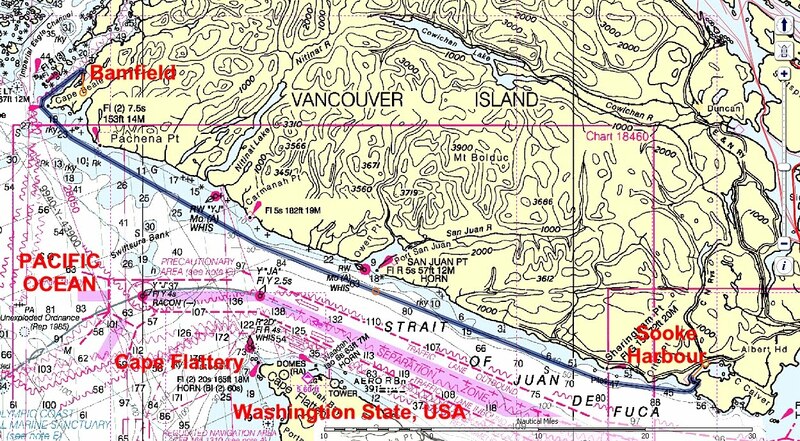 We could bale out at Port San Juan but now, as we enter the Strait of Juan De Fuca, the seas calm and the flood current adds almost 2 knots to our speed. This is living! Our cell phones come alive with AT&T cell service from Washington State. Quick make your calls now, download the email without Canadian surcharges. 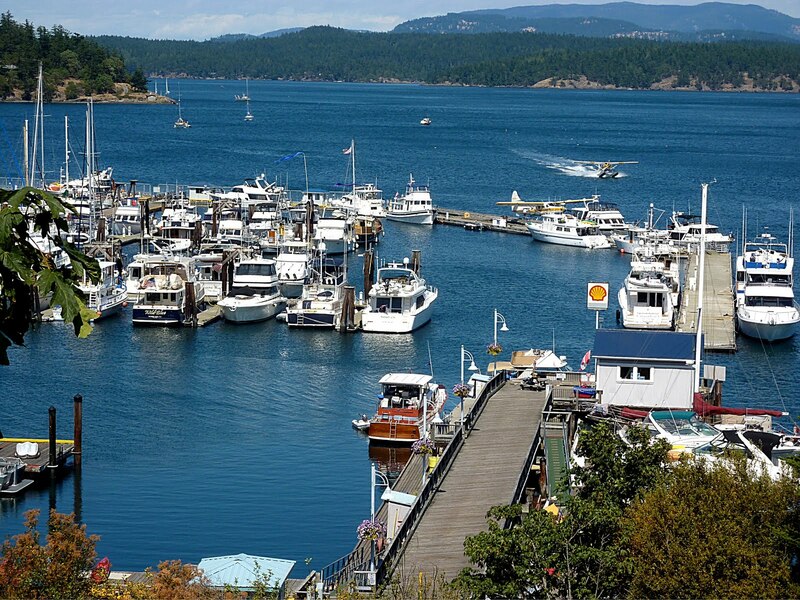 We do and by 1PM we are entering Sooke Harbour in flat seas. Sooke Harbour entrance is flat with just a little flood current pushing us inward. As we round the point, we see this unique catamaran passing us outbound. Note the guy up in the "wishbone" rig. 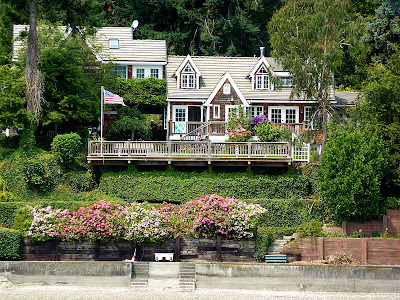 Not sure if this is a power boat, sailboat or house boat. The public dock had space for us in Sooke. 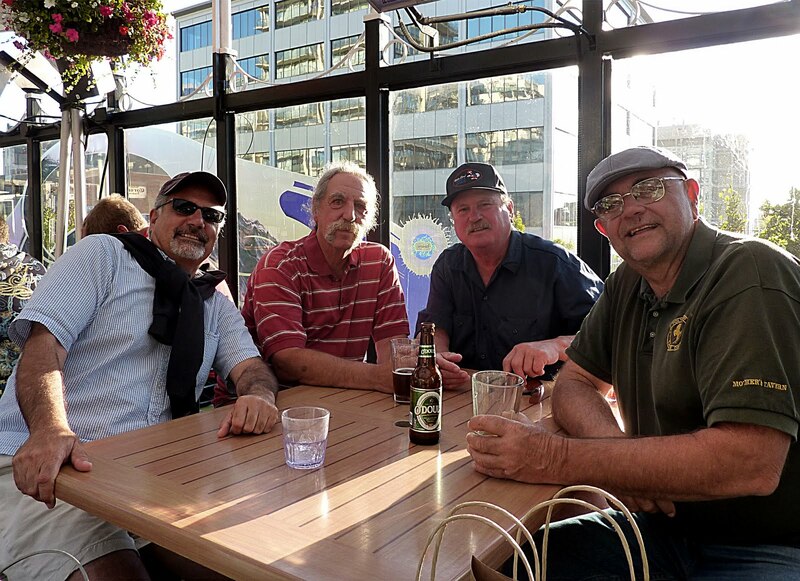 A genuine Canadian pub was conveniently located just a short walk away. We partook. 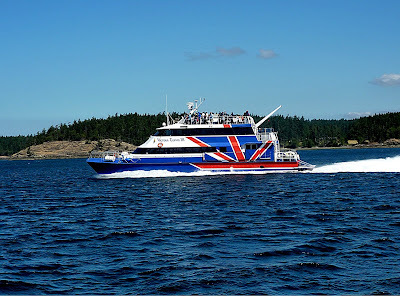 Sooke is also attempting capitalize on tourism. This new hotel resort is under construction just in front of the marina. 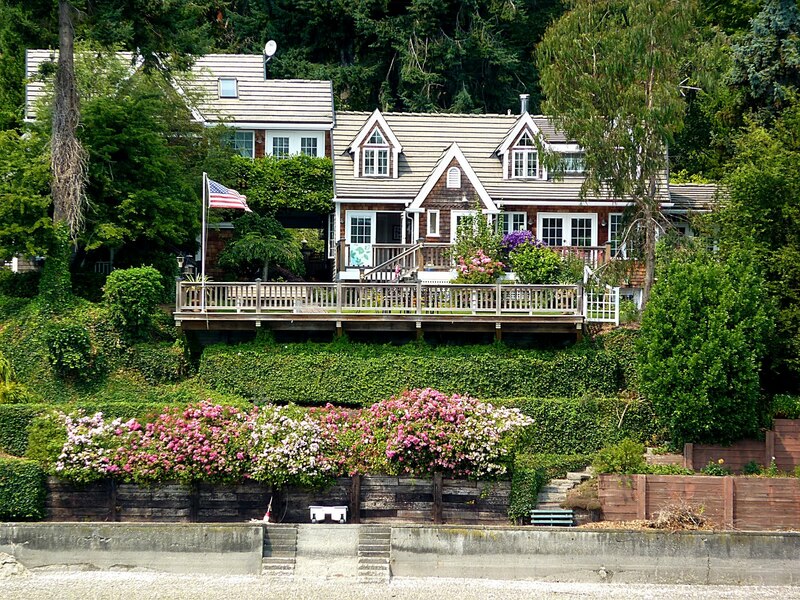 Several beautiful homes line the harbour. This one was our favorite. It was Willie's prawns and buffalo chicken wings tonight with John Wayne starring in El Dorado for dessert. 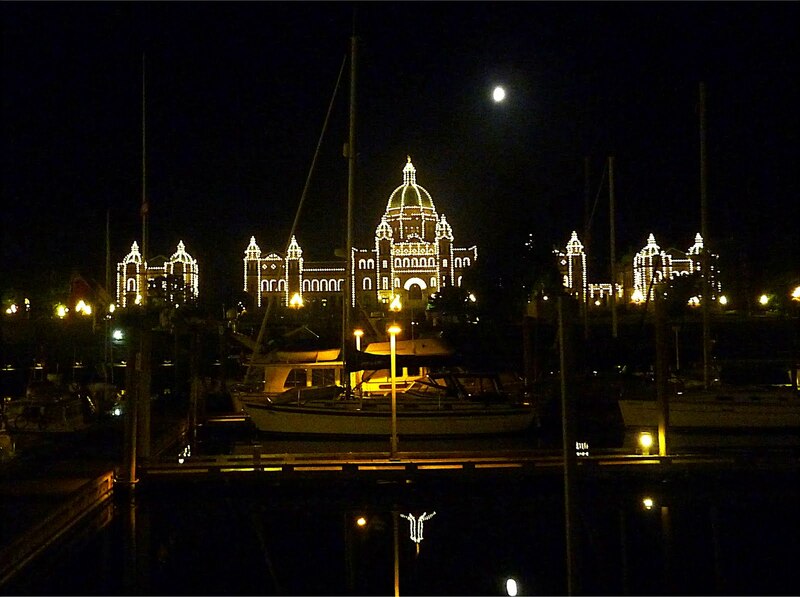 Tomorrow it's on to the City: Victoria.